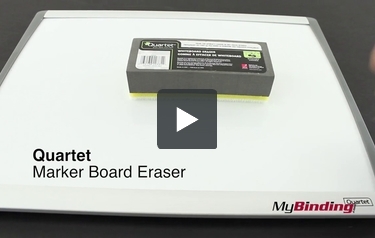 The Quartet Marker Board Eraser makes the perfect companion to any dry-erase board. The soft, lightweight eraser material is washable, allowing for years of use. The soft bristles collect unwanted marker dust, leaving the dry-erase board surface looking fresh and clean. 5" x 2-3/4" x 1-3/8"
Welcome to MyBinding video. This is the Quarter Marker Board Eraser. It's not very exciting so you'll want to sit down for this one. Here it goes. MyBinding written on a whiteboard, smiley face following, and off it goes. It's like magic. It's almost like this washable soft bristle dust collector is an eraser. For more demos, reviews, and how-to's, check out MyBinding.com.